Most merchants we talk to are unaware of what Interchange Optimization means and how it ties into Level II and Level III processing, and the beneficial financial impact Interchange Optimization has on a company’s bottom line. The direct answer is that Interchange Optimization is based on industry-specific program requirements created by the card brands (Visa, MasterCard, Discover, AMEX) that allow for a reduction in qualifying interchange rates. Each card brand sets minimum requirements for additional information, besides the standard info such as the customer’s name, credit card number, and CVV number. The card brands agree to offer a percentage discount off of their qualifying interchange rates, but in return, they want particular additional information entered into each credit card sale to accommodate their specific cardholders. WHAT TYPES OF MERCHANTS QUALIFY FOR INTERCHANGE OPTIMIZATION? We find a diverse mix of businesses can benefit from Interchange Optimization such as retail merchants, merchants that offer professional services or products to consumers, business-to- business merchants, and eCommerce merchants. Retail merchants often don’t realize they can qualify for Interchange Optimization because most think that swiping a credit card is enough to achieve Interchange Optimization. Many retail merchants have customers that use their business cards to make payments to them. When we analyze a retail merchant’s credit card statement many times, we surprise a merchant by the number of business cards, corporate cards, and commercial purchase cards that they are taking. Those business cards, corporate cards, and commercial purchase cards can all qualify for Interchange Optimization Savings. We find that Interchange Optimization is important for almost any business. HOW TO IDENTIFY YOUR LEVEL OF INTERCHANGE OPTIMIZATION? A big challenge for business owners is the difficulty in examining their statements to identify all the card types that qualify for Interchange Optimization. At Moneck Payment Solutions, we are properly trained on how to review all the different types of merchant statements. During our analysis we will determine whether a merchant is competitively priced. We will also identify the pricing model currently in use, and we will assess the number of transactions, dollar amount, and percentage of the credit card payments, for the particular processing month, that can qualify for Interchange Optimization. We will also assess the merchant’s existing payment system and identify if there are areas of opportunity to improve upon it. Upon completion of our review, we will present our findings and make our suggestions. With Interchange Optimization each merchant can realize anywhere from .05% to 1.10% savings on each qualifying credit card payment transaction. Merchants will find our analysis very insightful and helpful. Upon implementing one of our payment systems, a merchant can begin to receive lower interchange rates directly from the card brands, such as Visa and MasterCard. ARE THERE DIFFERENT LEVELS OF INTERCHANGE OPTIMIZATION? The line-item detail must be passed for every transaction per the card brands specifications. The merchant must process transactions via a third-party gateway that supports Level II and Level III Processing. At Moneck, the payment systems we offer support Interchange Optimization for retail, mobile payments, hand keyed card not present, and eCommerce. We also offer payment systems that automatically pass the card brand’s line-item requirements needed for a merchant to obtain Level II and Level III rates. Our payment systems make it easy to achieve Interchange Optimization since the only responsibility for a merchant is to swipe, dip, key-enter their customer’s credit card number, or have their customer key enter their credit card information through a shopping cart. Our payment systems are also safe and secure. DO ALL PRICING MODELS QUALIFY FOR INTERCHANGE OPTIMIZATION? 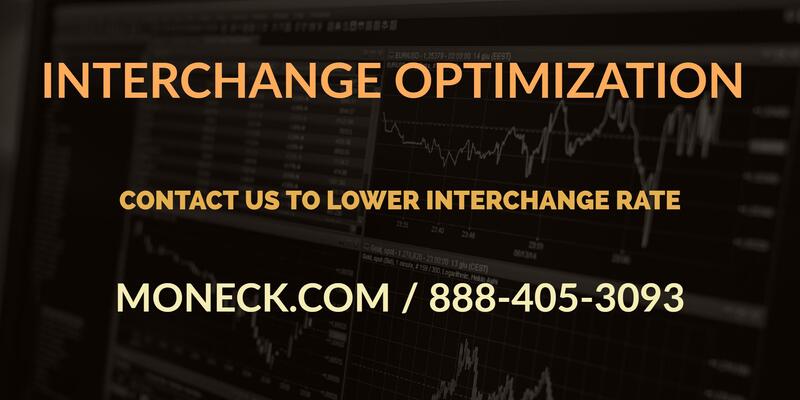 Lastly, the only way a business owner can benefit from Interchange Optimization is if they are utilizing a pricing model called Interchange Plus Pricing (contact us on what this means). If a merchant is using a tiered or flat rate pricing model as made popular by Square, Stripe, and PayPal, then they are missing out on enjoying lower interchange costs from the card brands and in potentially lowering their overall effective rate.